To install a grouted rock anchor requires first drilling a 6"-diameter hole. Then insert the anchor, assembled with any round rod extensions and guy adapter needed. Portland-cement grout pumped in to completely fill the hole around the anchor takes approximately five days to cure. 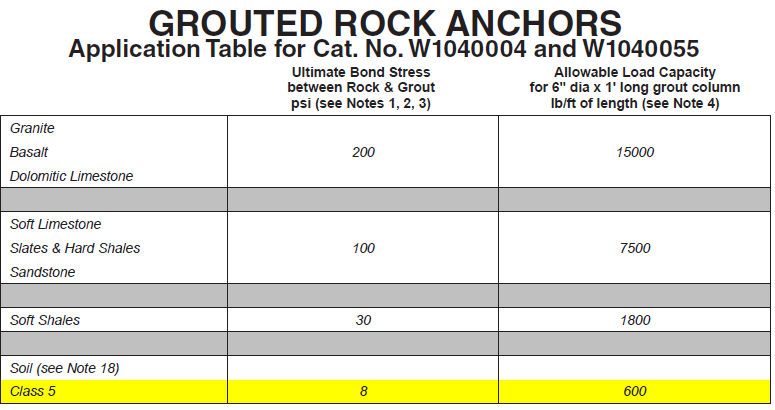 Ultimate bond stress values from the PTI (Post Tensioning Institute) and the grout to ground bond values from the FHWA (Federal Highway Administration) were used to arrive at the indicated ultimate bond stress between rock and grout used in the above chart. Identification of the rock and application of the chart values is the responsibility of those designing the rock anchor. The values in the chart are intended to provide conservative results. Higher bond stress values may be obtainable, but the associated investigation to determine appropriate values and the use of those values is left to those designing the rock anchor. The given ultimate stresses were applied over the surface of a 6" diameter x 1' long grout column, then divided by 3 to obtain the recommended allowed load per foot of length in the indicated rock or soil. Actual capacities will depend on the strength of the rock, the grout strength and the quality of the installation. A rough surface in the drilled hole is preferred as well as a clean hole free of loose material, soil, dust, etc. A 6" diameter hole is recommended for the use of the W1040004 and W1040055 rock anchors. The minimum bond length of the rock anchor to be engaging the rock is 5 feet. It is recommended that field testing be completed to confirm capacities. Anchor grout is to be made using Type I, II, III, or V Portland Cement conforming to ASTM C-150 specifications. The compressive strength of the grout should be 3000 psi at the time of stressing. The grout should be flowable to reach the bottom of the drilled hole or pumpable if it is to be placed via a grout pump. The ultimate mechanical strength of the W1040004 and W1040055 rock anchors and associated extensions and terminations is 70,000 lbs when CHANCE anchor components are used. Water used in the grout mix should be potable (suitable for public consumption), clean and free of substances known to be harmful to port land cement or steel. It is recommended that grout be placed in the hole prior to inserting the rock anchor. When using pre-packaged grout mixes, follow directions and use the water cement ratio recommended by the manufacturer. For recommendations concerning bonded lengths and un-bonded lengths, reference the PTI specifications. The rock anchor is to be installed in line with the guy wire. Any misalignment is to be no more than ± 5 degrees.